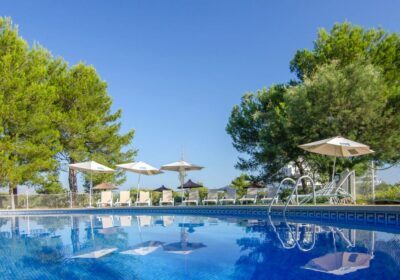 Alcudia Free Child Places Low Deposit Alcudia Family Holidays @ Web2travel.co.uk Best Value Hand-Picked Holidays to Alcudia from UK airports Since 2000. Free Child Places Alcudia Holidays are available from a number of Tour Operators and Online Travel Suppliers. Web2travel compare Companies who offer Free Child Places Holidays to Majorca and make it easy for you to book the Best Value Holidays, online direct with Tour Operator. Free Child Places are available of All Inclusive Holidays Alcudia, Majorca and Self Catering Holidays in Alcudia, Majorca. Alcudia Family Holidays have become more popular once again as Mallorca is seen as a safe holiday destination compared with other parts of the world. A popular and well established holiday resort offering a great choice of accommodation, a wide variety of activities to participate in, and a large number of bars and restaurants for wining and dining. Alcudia has three distinct areas; the Old Town full of historical sites, Alcudia Port packed with restaurants and bars, and Alcudia Beach where many of the hotels are based along the wide stretch of golden sand which runs for several miles. Alcudia is popular during the summer, particularly during the school holidays. It is possible to stay here in the winter as it has a relatively mild climate, but getting around is not so easy unless you choose car hire. The Weather Forcast for Alcudia is generally good with average daytime temperatures of 14 Degrees in December and January rising to 27 Degrees in July, August and September. The 3 km Alcudia beach starts at the Port of Alcudia and continues on for some 14 km into the neighbouring resorts of Playa de Muro and Ca’n Picafort. Consisting of fine white sand with an average depth of 80 metres and a shoreline which gently shelves into the clear shallow water it’s ideal and very popular with families. There are plenty of facilities available along this well-liked beach with numerous water sports including jet-skis, paragliding and banana rides; the promenade is backed with hotels, and many restaurants, cafes and shops. 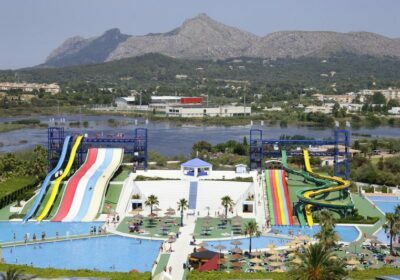 There are a number of fun attractions in the resort of Alcudia, families in particular will enjoy the Hidropark which offers pools, waterslides, mini-golf and much more, there is also the Laberinth Maze, a large karting track and on the resort outskirts a ranch where horse-riding is available.. Attracting those seeking history and culture the ancient walled town of Alcudia Old Town is full with Moorish and Roman influences, it’s situated 1.5 km inland from the port and features narrow winding streets and beautiful architecture. Just outside of the city walls are the ancient ruins of a Roman town including a small amphitheatre, and to the north of the town is a 19th century bull ring. Within the walls there are a number of small restaurants providing a more authentic Mallorcan experience, with local specialities and tapas. Throughout the year the old town also hosts a market both on Sundays and Tuesdays. Alcudia Port is where you will find a great range of shops, restaurants and bars, it’s also a popular place for nightlife with a number of late night bars offering live music and karaoke, as well as discos. Nature lovers and bird spotters will enjoy the S’Albufereta Natural Reserve and the larger S’Albufera Natural Park, these large areas consist of marsh, lakes, riverside woodland and coastal ecosystems, and are packed with wildlife and many species of bird. The old town of Pollensa around 15 km inland, features some interesting historical buildings along with the 365 Calvario Steps which lead to a hillside chapel. Alcudia Cheap Hotels are available as Web2travel.co.uk Compare Hotel Deals from multiple suppliers to offer best value Hand-Picked Alcudia hotel deals. Hotels include Grupotel Los Principes Hotel, Orquidia Playa Hotel, Viva Eden Lago Apartments.